« From $139,900! Affordable Surrey G3 Residences in Guildford Community > Studios to 2 Bed Floor Plans > Grand Opening at G3 Surrey Condos! Starting from the low $200’s, BOSA presents the newest addition to the Coquitlam real estate market. The new high-rise tower will be called EVERGREEN by BOSA Properties and pre-sales are expected to begin early Summer 2012! Not only is BOSA one of our favourite local builders, but the EVERGREEN Coquitlam condos will centrally located so that you are literally steps away from the new Evergreen SkyTrain line that connects you to everything in the Lower Mainland, which includes downtown Vancouver in just a few minutes. The new Coquitlam EVERGREEN by BOSA Properties is part of this exciting rapid transit community where you can leave your car at home (or not own one at all) and still be minutes away from entertainment, restaurants, shopping, local amenities and services. Also, the new pre-construction Coquitlam EVERGREEN by BOSA condos are very close to Coquitlam Centre, home to major retailers and grocers that include the likes of The Bay, T&T Supermarket, Chapters and many more daily conveniences. 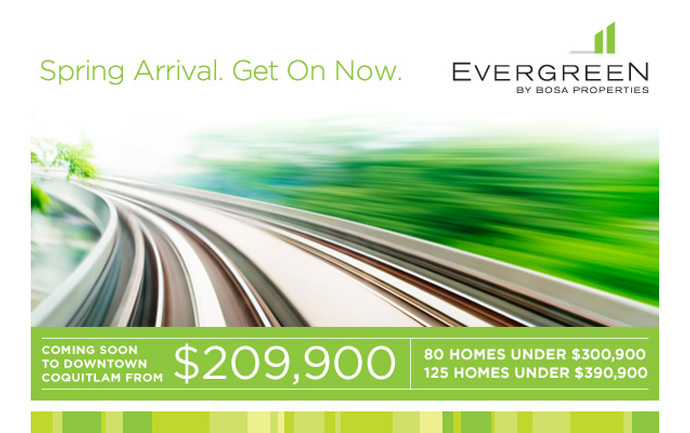 What’s more, Evergreen by BOSA Coquitlam condos will be very affordable with homes starting from just $209,900. The presentation centre is already under construction and will be launching early June! The pre-construction Coquitlam Evergreen by BOSA represents some of the best value in the Lower Mainland, so what are you waiting for? For more information, go to BosaProperties.com or you can simply register on our web page for an unbiased opinion on what makes the new Coquitlam Evergreen Condos by BOSA such a tantalizing opportunity for first time homebuyers to downsizers and to Coquitlam condo investors. EARLY PURCHASER BONUS – FOR FIRST 80 HOMEOWNERS ONLY AT EVERGREEN COQUITLAM CONDOS. Be among the first to purchase at Evergreen by BOSA and be rewarded with an Early Purchaser Bonus. The larger the home, the more significant the discount. What’s more, the first 80 to purchase will also receive a free storage locker. Great Suites. Great Value. Steps to the Evergreen Line. 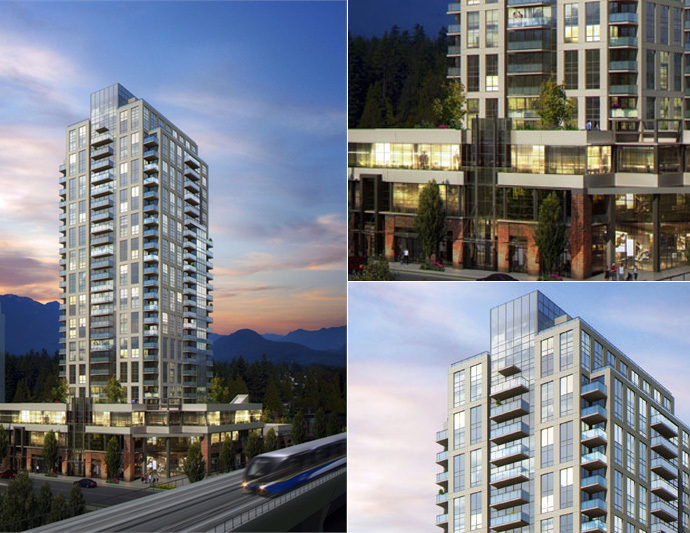 Since 2003, Bosa Properties has been reshaping the downtown Coquitlam community and with the expected completion of the Evergreen SkyTrain Line in 2016, the most exciting addition to the neighborhood is definitely the Coquitlam EVERGREEN condo tower. The mixed use project will consist of 195 homes for sale, office and retail space in a signature high-rise tower in the centre of it all. Bosa Properties is the top developer in the Lower Mainland and they are well known for their customer service, quality craftsmanship, high-end finishes and attention to detail. According to their Coquitlam EVERGREEN condo marketing, the project will be centrally located where home owners can live without boundaries. The promise of a unique community with a direct connection to anywhere in the Lower Mainland is one of the greatest features of the new EVERGREEN Coquitlam condo project. Evergreen by Bosa Properties is the address for everything you value today. And all you plan for tomorrow! Situated next to Coquitlam City Hall and just two blocks away from Douglas College, the downtown Coquitlam EVERGREEN condos for sale will also set you within walking distance to great shops and restaurants at Coquitlam Centre. Inside, home buyers can expect to find luxury finishes that include Kitchen Aid, Electrolux and Grohe appliances and fixtures in addition to Italian cabinets. EXCITING NEWS about Evergreen Coquitlam Condos by BOSA! Some of the urban amenities within walking distance or a short drive away includes Douglas College, Pinetree Secondary & Elementary Schools, Walton Elementary School and Glen Elementary. For outdoor enthusiasts, the pre-construction Coquitlam Evergreen condos by BOSA will be very close to Lafarge Lake, Coquitlam River Park, Eagle Ridge Linear Park, Scott Creek Linear Park, Hoy Creek Linear Park, Glen Park and Town Centre Spray Park. Other community recreational opportunities for home owners at the Evergreen by BOSA Coquitlam condos includes the City Centre Aquatic Centre, Coquitlam Public Library, Evergreen Cultural Centre, Summit Community Centre and the Pinetree Community Centre. There is also lots of shopping surrounding you at Coquitlam Centre, Westwood Mall, Sunwood Square, Pinetree Village, Coquitlam Square, Poco Place and Henderson Place. The price of convenience, low maintenance high-end living is truly affordable right here at EVERGREEN by Bosa Properties. The Evergreen Coquitlam condos with start from just $209,900 for 551 sqft one bedroom suites to the largest 1,057 square foot 2 bedroom plus den floorplans that start from just $469,900. There is NOTHING like Evergreen Coquitlam condos by Bosa Properties in the downtown Coquitlam real estate market today so get in on a ground level entry opportunity for the newest and most exciting SkyTrain serviced neighbourhood in the Lower Mainland. Here are the new Coquitlam Evergreen floor plans (draft layouts only and are subject to change at any time). As someone that has expressed interest in a previous Bosa Properties project, we’re writing to you today to provide you with some exciting news about Bosa Properties’ newest offering, Evergreen in Coquitlam. 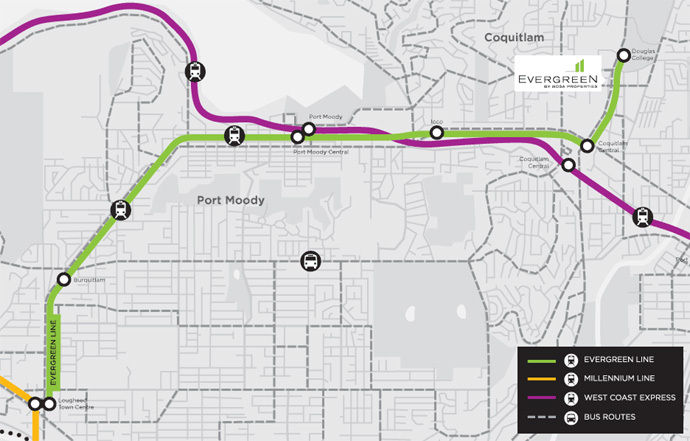 Evergreen is the lower mainland’s next rapid transit community, located just steps from the new Evergreen Skytrain line in downtown Coquitlam real estate market. Our Evergreen Coquitlam condo homes come fully-fitted with European kitchens, Grohe faucets, Kitchen Aid appliances, and legendary Bosa Properties floorplan and interior design. What’s more, the pre-construction Coquitlam Evergreen by BOSA condo tower sits next to Coquitlam City Hall, two blocks from Douglas College and steps from renowned shopping mall – Coquitlam Centre. Whether you are looking to live here or to own a home as an investment, this area truly is at the centre of it all. For the past 5 decades, Bosa Properties has worked hard to earn the trust of hundreds of home owners and are committed to making certain that owning a Bosa Properties home will be as carefree as possible. Located in Coquitlam Centre real estate neighbourhood the new BOSA Evergreen Coquitlam condo tower is ideally located just steps away from the newly approved Evergreen SkyTrain Line in the downtown centre. Evergreen Condos in Coquitlam real estate market will also be just steps away from Coquitlam Centre shopping/dining, big box retail stores, T&T Supermarket and local services. Think recreation and outdoor enjoyment as well. The BOSA Evergreen Coquitlam condos are also ideally located minutes away from beautiful Lake Lafarge as well as Traboulay Trail in addition to golf courses and local community/recreation centres. The affordable Coquitlam condos at Evergreen by BOSA start from just $209,900, representing the best real estate value in town and in the Tri-Cities area. The presentation centre for the new Evergreen BOSA Coquitlam condo tower will be opening very soon and the anticipated launch is in early Summer. It’s already under construction and you can register online for more details as they are released.